Is It Legal to Wear Earbuds While Driving? The answer to our latest installment of 'Is It Legal?' is going to be music to many people's ears (hint, hint). In the Silver State it is legal to drive your car while wearing earbuds or headphones. In fact, it's completely legal in most states! There are only a handful that have outlawed the common practice, one of the most recent being California, where not even bicyclists can wear earbuds. In others, headphones are illegal, but earbuds are not, and in at least one, wearing an earbud (singular) is okay, but not earbuds (plural). Use the stereo sound system if at all possible. In most cases this is the easier and safer choice. Keep the volume down to allow some outside noise in. If your music or whatever you're listening to is too loud, you may miss an emergency siren or other important noise. Consider leaving one ear free so you can hear external noises. Don't get distracted by your phone choosing songs or music apps while driving. Same goes for riding a bike! There you have it, in Nevada you may legally drive and sport earbuds or headphones. 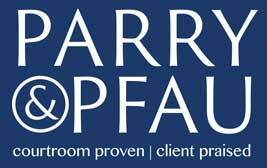 Do Parry & Pfau (and everyone else on the road) a favor though and stay safe by making good decisions. If you happen to make a bad choice or are caught up in collision contact our office for a free consultation. Older PostWhen Does It Make Good Sense to Be Sued?